Children 11 years of age or younger stay for free in parents room with existing bedding. Guests must be at least 19 years of age in order to rent a room. 10 percent commission paid promptly every month. Commissions are managed centrally by the Perot system TACS and are paid in the agencys local currency. Exceptions may apply-please see HP. 10 or more rooms constitutes a group. Please contact the groups and meetings department for rates. If reservation not cancelled by 5PM 1 day before arrival or guest does not show then 100 pct of stay will be charged Exceptions may apply-please see rate rules. 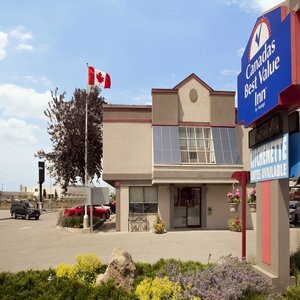 The Canadas Best Value Inn is conveniently located on Evans Avenue. Nearby Gair Drive and Brandy Lane Way close to Gardiner Expy Queen Elizabeth Way QEW. Prepare to be charmed by the newly renovated Canadas Best Value Inn Toronto. We welcome you to our great city. When you stay with us you are at the center of it all. Our convenient location is just minutes from Toronto Pearson International Airport and downtown Toronto. There are over 200 retail stores and restaurants within walking distance from our property. For leisure or business the Canadas Best Value Inn Toronto offers unmatched value and convenience. We offer many amenities including a business suites and spacious guestrooms. All suites and guestrooms come with complimentary hi-speed wireless internet and refrigerators. Microwaves are offered in selected rooms. Also provided in all rooms are Cable TV with HBO complementary in-room movies hairdryers iron and ironing boards. We offer complimentary calling within North America wakeup calls and access to fax service. All guestrooms come equipped with smoke detectors and the property has security cameras installed for additional safety. We also have a 24 hour coffee and tea bar in the lobby. A complimentary continental breakfast is offered to our guests. Our front desk is open and ready to assist you in any way possible 24/7. Our courteous staff looks forward to making your stay a memorable and enjoyable experience. We invite you to come and discover the great city of Toronto the heart of Canadas business and cultural life. Toronto is Canadas leading center for finance art publishing theatre music film and sports. Home to a mosaic of cultures Toronto boasts several annual multicultural festivals. Choice spots for shopping and eating include Little Italy Little India Little Portugal Chinatown and Greektown. Among the many must see area attractions are the Sherway Gardens Shopping Centre Mall the Harbourfront Centre Rogers Centre adjacent to which is the world famous CN Tower. The Hockey Hall of Fame the Royal Ontario Museum and the popular Woodbine Racetrack and Slots Park attractions are also nearby.